William Stafford, "What's In My Journal"
It's the birthday of the psychologist and philosopher William James, born in New York City (1842). He was the older brother of the novelist Henry James, and one of the most prominent thinkers of his era. He was a man who started out studying medicine and went on to become one of the founders of modern psychology, and finished his life as a prominent philosopher. He was a professor of physiology at Harvard when he was hired to write a textbook about the new field of psychology, which was challenging the idea that the body and the mind were separate. He could have just written a summary of all the current ideas in the field but instead decided to explore the issues of psychology he found most interesting and perplexing. He took twelve years to finish the book called, The Principles of Psychology (1890). It was used as a textbook in college classrooms, but was also translated into a dozen different languages, and people read it all over the world. One of the ideas he developed in the book was a theory of the human mind which he called "a stream of consciousness." Before him the common view was that a person's thoughts have a clear beginning and end, and that the thinker is in control of his or her thoughts. But William James wrote, "Consciousness ... does not appear to itself chopped up in bits. Such words as 'chain' or 'train' do not describe it fitly as it presents itself in the first instance. It is nothing jointed; it flows." James's ideas about consciousness were especially influential on writers, and novelists from James Joyce to William Faulkner began to portray streams of consciousness through language, letting characters think at length and at random on the page. Consciousness itself became one of the most important subjects of modern literature. He also helped invent the technique of automatic writing, in which a person writes as quickly as possible whatever comes into one's head. He encouraged audiences to take up the practice as a form of self-analysis, and one person who took his advice was a student named Gertrude Stein, who went on to use it as the basis for her writing style. William James wrote, "The stream of thought flows on; but most of its segments fall into the bottomless abyss of oblivion. Of some, no memory survives the instant of their passage. Of others, it is confined to a few moments, hours or days. Others, again, leave vestiges which are indestructible, and by means of which they may be recalled as long as life endures." He also wrote, "Common sense and a sense of humor are the same thing, moving at different speeds. A sense of humor is just common sense, dancing." 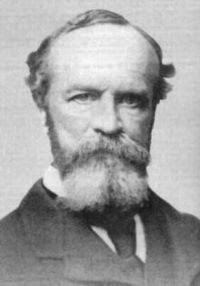 William James (January 11, 1842 – August 26, 1910) was a pioneering American psychologist and philosopher. He wrote influential books on the young science of psychology, educational psychology, psychology of religious experience and mysticism, and the philosophy of pragmatism. He was the brother of novelist Henry James and of diarist Alice James. William James was born at the Astor House in New York City, son of Henry James Sr., an independently wealthy and notoriously eccentric Swedenborgian theologian well acquainted with the literary and intellectual elites of his day. The intellectual brilliance of the James family milieu and the remarkable epistolary talents of several of its members have made them a subject of continuing interest to historians, biographers, and critics. James interacted with a wide array of writers and scholars throughout his life, including his godfather Ralph Waldo Emerson, Horace Greeley, William Cullen Bryant, Oliver Wendell Holmes, Jr., Charles Peirce, Josiah Royce, George Santayana, Ernst Mach, John Dewey, W. E. B. Du Bois, Helen Keller, Mark Twain, Horatio Alger, Jr., James George Frazer, Henri Bergson, H. G. Wells, G. K. Chesterton, Sigmund Freud, Gertrude Stein, and Carl Jung.